May has been a month of hot sunny days, and many people are already working on their summer tan. I however, am practically reflecting the sun off of my skin I'm so pale! It's hard to get time to go out an enjoy the sunshine and soak up that good old vitamin-D - especially when the sun only seems to come out Monday - Friday! And to be fair, it is not all the sun's fault for poor timing, it also likely has something to do with the fact that when I am out in the sun, I always wear my favorite giant sunglasses, so many rays don't actually reach my face anyways. Looking for a happy alternative to tanning, I have been in the market for a product to help give me a natural sun-kissed glow. I'm sure you've heard it before - Tanning is not good for your skin - it leaves your skin dry, dehydrated, and can also lead to cancer. I spent a fair share of time in a tanning bed, but I have given up on spending way to much money on a habit that has the potential of giving me cancer (huh...sounds like a non smoking commercial). I do not judge those who do continue to use tanning beds, I will admit, it is relaxing, and always nice to see results! However, I personally want to find another option that not only gives me the results I want to see, but is actually healthy for my skin too. I have thought about using an all over sunless tanner, like Jojoba Tan (which smells delicious by the way), but it makes me nervous to use a lotion all over, because unless you have somebody to get those hard to reach places- like your back- there is a risk of looking uneven. I would personally rather be whiter than Casper than splotchy like a calico cat. I tried using a gradual tanner back in high school, which worked nicely, and helped avoid bare spots, but it really was gradual - it was a 3 or 4 month process to finally get the perfect glow. I'm still unsure if I will ever use an all over tanner, but for the sake of trying new things, and giving an honest review, I purchased my Jojoba Tan and tried it out on a spot on my arm, and it really does look smooth and natural toned (not orange). 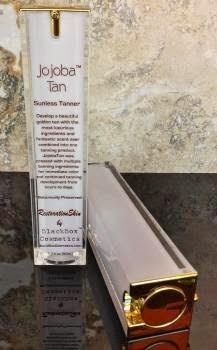 So if you do use an all over self tanner, or are in the market for one, then I really would recommend trying out BlackBox Cosmetics' Jojoba Tan. I currently use bronzer on my face, mostly just for definition, but sometimes for colour. A problem I have with powdered bronzer though, is that if you ask for too much (like the natural look of a glowing tan) then you run the risk of actually looking like your face is dirty. In my opinion, it really should be strictly used for definition only. 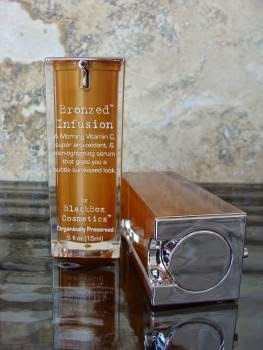 I have recently had my eye on BlackBox Cosmetics' Bronzed Infusion, which works similarly to Infusion AM, by fighting free radicals, and being packed with a high content of Vitamin C and super anti-oxidants - so it's great for your skin. Bronzed Infusion, also has a touch of colour to add a sun-kissed look to your skin. I am a huge fan and firm believer of BlackBox Cosmetics' products, so I am looking forwards to adding this into my shopping cart, and seeing if it will help me accomplish a healthy looking glow!